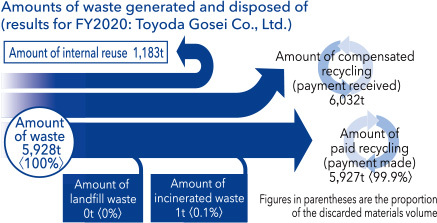 Building Recycling Societies | Toyoda Gosei Co., Ltd.
Toyoda Gosei uses resources effectively and contributes to a recycling society by reducing waste volumes*1 and water usage and designing products that are easily recyclable. 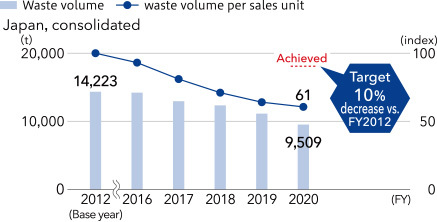 *1 We are currently attempting to reduce waste volumes to meet our FY2020 target as we move toward minimization of industrial waste as set forth in the TG 2050 Environmental Challenge. To move closer to recycling society envisioned in the TG 2050 Environmental Challenge, Toyoda Gosei aims to minimize industrial waste and water usage and we are making every effort to use resources effectively, reducing materials usage and waste volumes through thorough sorting and the design of easily recyclable products. Frequent water shortages and floods have become a major problem in all parts of the world. We are attempting to identify these risks in every country and region where we have operations while also striving to give back to the community by reducing water usage, recycling water, and releasing cleaner wastewater. We develop and design easily recyclable products and materials with thought to the entire lifecycle of automobiles. We are also developing recycling technology for waste material. So far we have established recycling technologies for products that use multiple types of rubber and products that use rubber and different materials. In FY2017 we continued our recycling efforts for effective use of resources. To reduce waste in production processes and achieve our FY2020 targets, we are taking measures to combat waste at its source and recycle. We have also started a waste reduction project with coordination among plants and production technology, materials technology, and product design departments to strengthen efforts to combat waste at its source with a view to accomplishing the TG 2050 Environmental Challenge. Individual plants conduct reduction activities with genchi-genbutsu, while item identification by outside experts is conducted to reduce rubber, plastic and liquid waste. Study sessions are also held to promote waste reduction at both domestic and international Group companies. Previously, the pad and metal were riveted and caulked. As a result, when there was a problem the product could not be taken apart and it all had to be disposed of as waste, including good components. By switching to a fixation method that allows for easy dismantling while maintaining quality, and for separation of each material component (plastic pad, cloth, metal), waste was reduced by about 8.5 tons as a result of recycling and converting waste into valuables. We will continue reducing waste with similar approaches. Leather scraps produced at Toyoda Gosei include pieces that have blemishes remaining in the hide. These pieces have been disposed of as waste, but employees proposed producing novelty goods using scrap leather as one activity to reduce workplace waste. Their efforts succeeded in creating marketable products and have led to a reduction in waste. 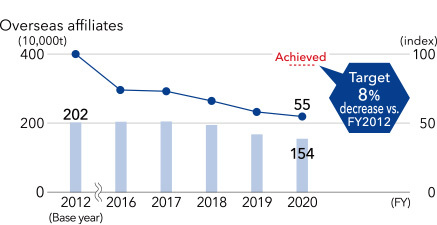 To reduce the amount of packaging used during product transport, we set annual targets for continuous improvement. In FY2017 we reduced the packaging used to prevent contamination by increasing the number of times reusable containers are used and maintaining their cleanliness. We will continue to make improvements in appropriate ways, including the reduction of packaging with the use of lids on reusable containers and other means, all the while considering the balance between maintaining product quality and reducing weight. *5 The amount of packing material used has increased with the increased shipments of spare parts due to the 2016 Kumamoto earthquake and the flooding in northern Kyushu in 2017, as well as the larger size of parts. 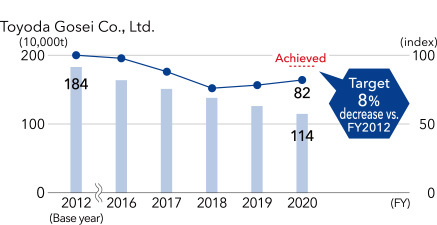 To achieve the FY2020 targets, we are working on kaizen through TG ESCO (expert team that conducts reduction activities with genchi-genbutsu) activities. 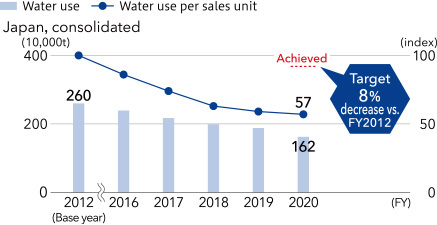 Water use has been reduced 12% compared with FY2012 levels by correcting loss and leakage in water use amounts. Wastewater treatment facilities are also being systematically upgraded to improve our processing ability so that wastewater is cleaner and the water recycling rate is higher. This year we will upgrade the wastewater treatment facilities at our Morimachi Plant. We will continue to reduce water usage and manage wastewater in correspondence with local conditions, given the increasing importance of water. 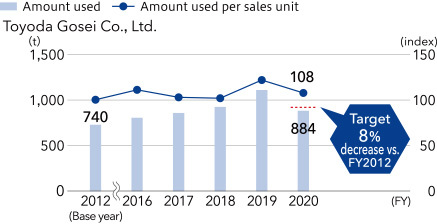 The Morimachi Plant has switched to low-flow, high pressure nozzle heads in the dishwashing area of its cafeteria, resulting in an approximately 60% reduction in water usage. We will continue these kinds of efforts to use water efficiently and decrease water usage. Toyoda Gosei Group company Hoshin Gosei Co., Ltd. reduced water usage about 3% by recirculating water in production processes, installing green curtains, and using rainwater to water plants in employee rest spaces.